Men are increasingly starting to dye their hair and give special attention to its color. Whether you’re a mature man looking to enhance or cover up his gray hair, or a younger man seeking a change in style, you can accomplish your hair-color goals with the right dye. To help you find the right dye for your use, we’ve put this handy guide together, compiling all of the best research and the top hair dyes on the market. We’ll go over the different types of hair dyes and what makes them different from each other before giving you some helpful advice in their application. Let’s start with a general overview of the best hair dyes on our list. Affordable, easy to apply, easily removable, fast-acting, gentle on scalp and hair. Versatile, fast-acting and vibrant, no dye added, comes in 4 colors. Let’s take a good look at some of the most important things to keep in mind as we shop for hair dyes. By paying attention to these aspects, we’ll be able to identify top hair dyes and avoid products that aren’t worth your time and money. Gel dye is the most common type of dye and it’s pretty easy to apply. It’s important to wear gloves for gel dye since the product can stain the skin of your hands if you end up spending a lot of time rubbing it into your hair. Gel dye doesn’t tend to wash out very easily unless you get a type that has that specifically mixed into its formula. Gel dyes come in all sorts of colors and lasting times. Some men find that gel dye works well for their hair, while others can get dry scalps or suffer other irritation problems when it’s applied. The only way to know for sure is to try; if you’re not sure where to start, a gel dye is a good first pick. Powder dye is the second most common type you’ll be able to find. It’s mixed into the hair much like gel dye and you should wear gloves during that process as well. However, powder dye has a greater chance of accidentally leaking onto your pillow or sheets as you sleep if you don’t apply it correctly or give it enough time to settle. For this reason, following the instructions very carefully is critical when applying a powder dye. Some men suffer similar dandruff problems on their scalp with the application of some powder dyes, although others have formulas that reduce the amount of dryness that might come about from its application. Powder dyes can come in all varieties of color, and some men report that red powder dyes are among the most natural looking for that particular shade of hair. For this reason, following the instructions very carefully is critical when applying a powder dye. Some men suffer similar dandruff problems on their scalp with the application of some powder dyes, although others have formulas that reduce the amount of dryness that might come about from its application. Powder dyes can come in all varieties of color, and some men report that red powder dyes are among the most natural looking for that particular shade of hair. Foam dye is the last type of dye you might find, and in general, it comes for darker colors only. Lighter color ranges aren’t typically found with foam dyes. You can usually apply these directly with your hands, as opposed to a brush or comb for gel dyes, and they tend to act very quickly. You should check any and all foam dyes for reviews and recommendations beforehand since they’re relatively new and many smaller manufacturers are still breaking into the market. Color: Color the next most important factor to think about. Obviously, this can change depending on your natural hair color. If you’re going to change hair colors altogether, try to find a dye that will have a dark shade of your chosen color; this will mask your natural shade more easily. However, if you’re going gray and are looking to cover this up, you can oftentimes get away with lighter shades of your chosen dye. For adding touches of gray to your natural hair color, you’ll find gray dyes specifically, and these will generally be applied very sparingly and gently. No matter what you choose, think long and hair about the decision unless you’re getting one of the easy-remove dyes that are only supposed to last for less than a day. Length of Time: Longer-lasting dyes typically take a little longer to apply but they represent much less maintenance time required to keep your new look. On the other hand, day-long dyes need to be reapplied each day, but they have less risk since they’re easy to wash out. For this reason, shorter-lasting dyes are great for experimenting or discovering what looks good in your hair before you move onto something longer-lasting. However, these sets come in packs of 3; when taken in with their asking price, what you find is a very valuable deal that provides you with a lot of gel for a minimal financial investment. The gel is a proven formula and is long-lasting, capable of coloring your hair for up to 8 weeks unless your hair grows out much more quickly than normal. The gel is easy to apply and doesn’t stand much of a chance of bleeding onto sheets or pillows. However, the color offered by this particular set is very generic and doesn’t offer much in the way of an actual statement in terms of fashion or look. 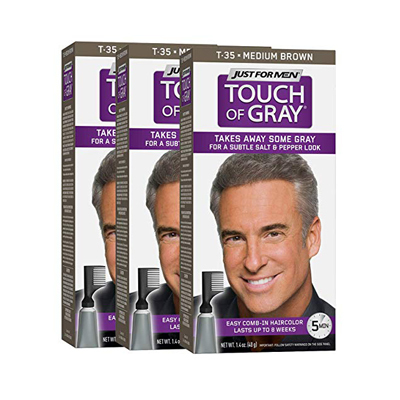 If you’re just graying, you might find that this set isn’t dark enough to color gray hairs that are heavier in tone than others. Altogether, though, we really like this tried-and-true formula for most male hair dye needs. If you’re stuck and don’t know where to really look, this is a great place to start. The black version of the above gel is just as reliable and effective. It’s another 3-pack, so the same value previously is present for this pick. It lasts for a similar amount of time and is also easy to apply; just follow the instructions on the box. Unlike the last color, it’s definitely dark enough to color any gray hairs or white spots that might be starting to appear with age. However, the coloring might bleed onto pillows or sheets if you don’t apply the gel correctly or if you hurry the process along. However, so long as you take your time and are careful you shouldn’t have any problems. 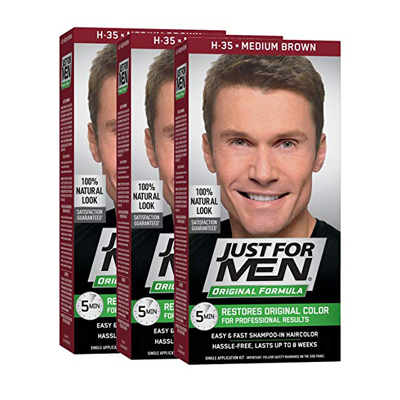 Staining of the skin is unlikely with the Just For Men formula, which is designed to reduce this risk. You should still wear gloves when applying the gel, however. This is another great pick from Just For Men and is perfect if you want black hair from a trusted brand. There are some darker gels out there, some of which we’ll look at, but this is among the most natural-looking in part due to its lighter shade of black. This 3-pack continues our look at the offerings from Just for Men, although it’s not quite as drastic as the others we’ve reviewed. This is because the Touch of Gray kit is made for men who are aging and want to show it. For instance, you might be leaning into your maturity and making sure that everyone knows you’re experienced instead of trying to cover it. For those types of situations, this gel is outstanding. 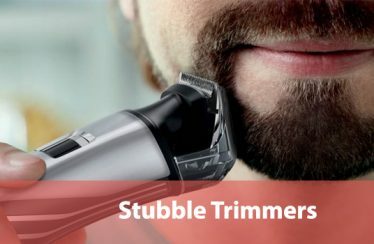 It takes the easy applicability of the earlier Just For Men packs and brings it here, and a small applicator comb is included with the purchase so you can be precise where you want to put it. This allows you to place some gray right at the temples or in stylish streaks depending on your preference. We really appreciate that there are hair dyes that allow older men to appreciate their natural coloring. 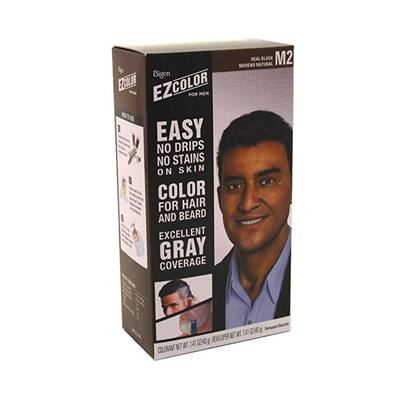 If you’re aging but don’t want to fight the process or think that the gray looks good on your face, try this kit out. It’s affordable and reliable. Here we have a daily-application gel that’s specifically designed for targeting graying hairs atop your head or in your beard. This kit comes in 4 different colors so that you can decide which of the gels matches your normal hair color the best. The gel formula is extremely fast-acting and is made to last for about the length of a workday. You should wash it out afterward and reapply it the following morning; thankfully, applying it is super easy and works in only seconds. Because of these factors, it’s perfect for touching up graying spots and finishing the touches on another, more permanent dye job. The value you can get with this kit is great since you get four different bottles in one. You’ll probably only use one yourself, but you could give the others to friends or coworkers once you see how well it works. It’s a great deal and is ideal if you only have a few spots you want to cover, or if you want to make a traditional “salt-and-pepper” look for your hair. Next, let’s take a look at this unique foam-based dye that relies on a different kind of formula from many of its competitors. This foam is applied directly to your hair and won’t stain your skin since the dye only attaches to hair fibers. This interesting application process is quick and can be modified based on how dark of a coloring you want. You can let it sit for the whole 20 minutes for an entirely-new sheen of black across your hair or let it rest for only half that time for a lighter shade; this is useful if your hair is already a soft black and you just want to intensify the effect. The formula is made without ammonia and without hydrogen peroxide. All of this makes the hair dye look very natural and smooth across the span of your head. Although this is a bit pricey, we really think it’s worth your while if you’re after a good black dye but don’t like to hassle with the traditional mess of gels. The can is really easy to take with you on trips or store in a cabinet, too. If you’re in the market for something more premium and enjoy having black hair even as you start to grow in age, this is a great pick. 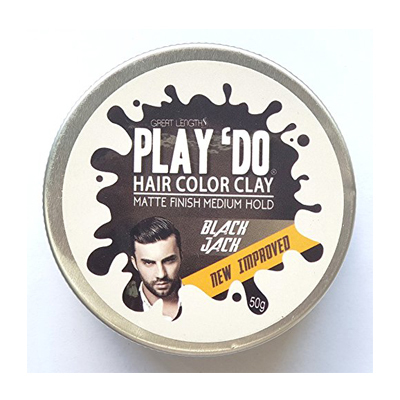 This is another interesting dye application formula that eschews traditional gel in favor of a wax, similar to the styling products that a lot of men use for aiding their daily appearance. The wax is easy to manipulate and spread around with your fingers, and it applies very quickly; you’ll see results in minutes. Despite the formula being wax-based, you’ll find that it’s gentle on your scalp and hair. 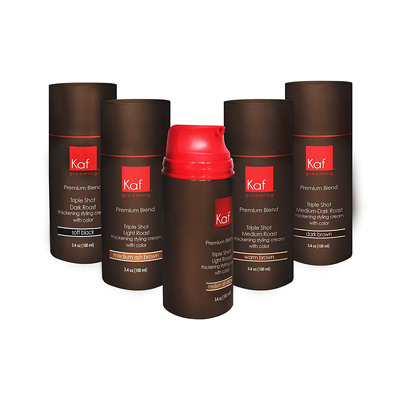 You don’t need to worry about dandruff increasing or in seeing a lot of your hairs being pulled free. Because it’s so easy to apply and move around, you’ll need to be careful to spread it evenly throughout your hair to avoid clumps and sudden darker spots that stand in contrast to their neighbors. However, this formula’s ability to be washed out quickly in the shower can translate to a bad time if you happen to walk in the rain. You’ll need to make sure that you avoid undue moisture on top of your head unless you want the coloring to start leaking out. This makes the dye lose a few points in our eyes, but we feel that it still fits a good niche for men looking for gel alternatives and who might benefit from a dark black dye that acts fast. It can also be useful as an emergency dye if your primary formula is lost or you unexpectedly run out. 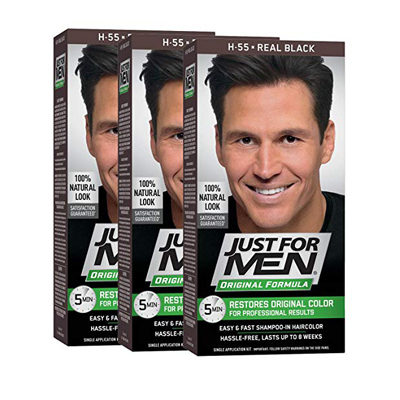 Finally, let’s take a look at a powder dye product that’s another great alternative for men who find that dyes are uncomfortable, or they don’t like their results. This powder formula is fast-acting and is superb at covering gray hairs. The rest of its effects at turning your hair black are decent, although it’s not as deep or close to “jet black” as a few of the other dyes we’ve looked at. For the price, it’s a great bargain since you get 3 kits in one. On the downside, the powder might stain your pillow or sheets if you don’t apply it correctly or if you try to hurry through the process. So long as you accurately follow the instructions, though, you should be okay. Your skin is not at risk of being stained no matter what. In addition, the powder doesn’t dry the skin of your scalp even after a long time of application. This makes the powder variant of dye a viable choice depending on your needs and particular skin irritants. Now that you’re armed with the best hair dye you could find, why don’t we go over some great tips and tricks to make sure that you apply everything correctly. Almost everyone who’s had some practice dyeing their hair knows how easy it is to accidentally stain your hands. Let’s go over the best tactics for hair dye application. Shower Beforehand: Before you apply anything, it’s important that you thoroughly wash your hair and remove as much oil and debris as you can. Both of those factors can negatively affect the dye as you rub it into your hair. Besides, it’s best to apply the dye when your hair is at its most natural color, shortly after you’ve showered and dried it totally. Also of note is to not shower immediately after dyeing your hair unless the instructions specifically ask you to. You might accidentally end up washing out the fresh dye and causing an incomplete process! Keep Your Hair Trimmed: This is related to the shower tip; you want to keep your hair at it’s ideal length for the dyeing process so that you can know if you like the look as you envisioned it right away. You’ll also want to have your hair trimmed so that you have to dye less hair overall, which might shorten your dyeing process and save you time altogether. Wear Gloves: For gel and powder dyes, it’s imperative that you wear gloves! You might end up staining the skin of your hands as they’re the implements that will be closest to the dye which is being rubbed in to your hair. Don’t forgo gloves, even if you use a brush or comb to apply the dye. In addition, you may want to have a towel around your neck or near exposed areas of skin if you’re using a gel or an otherwise runny formula. This will speed up your clean-up process. Read Instructions Carefully: This is super-critical to remember, even if you’ve applied dye before. Too many men just try to wing it and think that all dyes are applied the same. Instead, certain formulas require different preparation time or resting time after application. Read all the instructions as carefully as you can before actually starting the process. You’ll make fewer mistakes and enjoy your results a lot more. Be Patient: Finally, don’t rush the process. Hair dyes will act even if it seems like it’ll take a long time and if you try to hurry things along you might cause leaking or staining of your clothes or skin. It’s often helpful to have someone nearby to help you out with a towel if the dye spreads too far down your neck. Overall, just be sure not to become too impatient. With the long-lasting dyes, you’ll have great results and be saving time in the long run, anyway. With this guide, you should be more than ready to take your ideal hair dye and color your hair just the way you want it. Hopefully, this guide has answered all of your questions and shown you that hair dyes aren’t as complicated or scary as you might have thought. Instead, they can be a great way to express yourself! Thanks for reading!